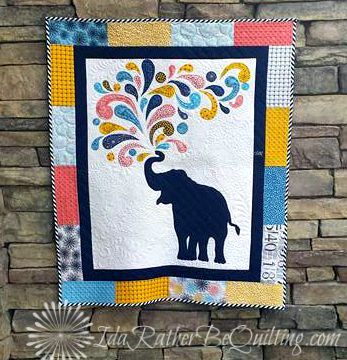 Remember way back in May when I started two elephant quilts? And then in July when I finished the mini version first? 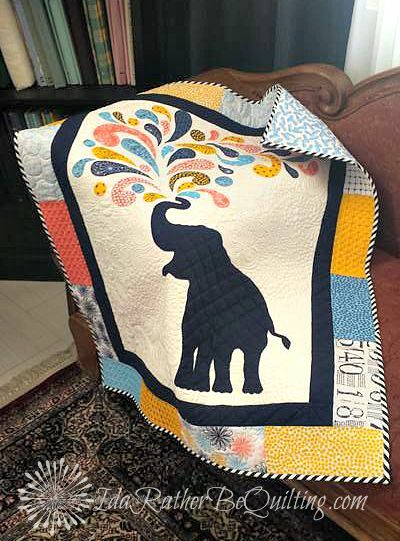 Even though the baby quilt size was for a baby that was already born? Yes, I know the baby is already like six months old. But I'm really hoping mama (who is a dear friend of mine from our time in Turkey) will forgive me. So just to refresh your memory, in case you don't have time to click through those previous posts, the fabric line is Figures by Zen Chic and the free pdf download pattern is Paisley Splash by Windham Fabric and is available (still, I checked) at this link. 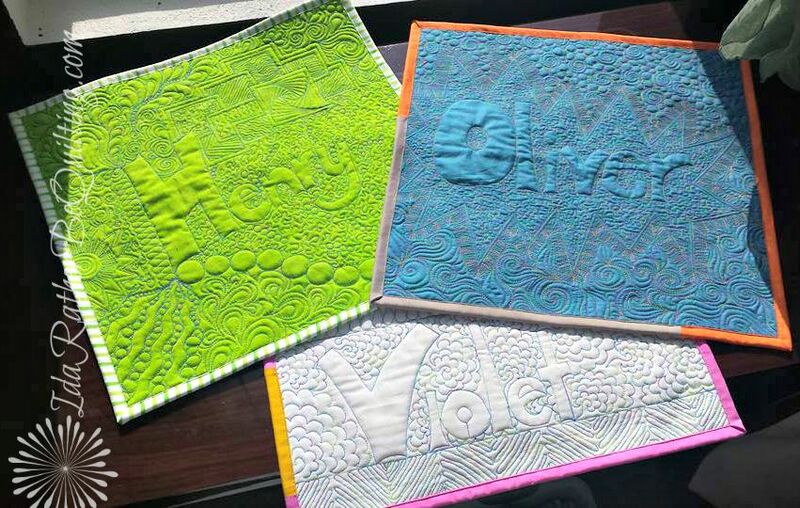 I always like to try something new with each project and my goal for this one was to get comfortable with graffiti quilting. The result might be on the severely over-quilted side but it was super fun. Actually, I'm thinking of starting up a support group for over-quilters. The addiction is real, people! 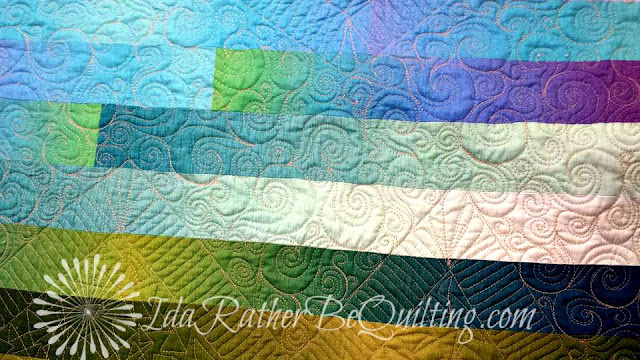 It was super fun to work on fitting different quilting designs and fillers together into all that delicious negative space. And also around and between the splashes. I found the most darling peanut fabric for the backing. It goes well with the quilt's name which is Poulsen Peanut. My friend's last name is Poulsen and she has called each of her babies a little peanut. This is my favorite shot. I was all done taking pictures and had placed the folded quilt on top of a chair. I came into the room a bit later and found the sun shining onto the backing and lighting up all that gorgeous texture. This shot has no filter. Poulsen Peanut will be going into a mailing box on Monday along with these three minis that I made over the summer for peanut's older siblings. If you want to see more detailed shots of these, just search Oliver, Violet, or Henry in my search bar. There is a post for each. Once upon a time, I was the mama of a very difficult toddler. So difficult that I sometimes got very angry. Have you heard the expression, "You will never know the depths of your anger until you become a mother." Of course you also learn much about the depths of your love, which is why I never wanted to hurt my difficult son. So sometimes I would put my darling little hellion to bed and then take a plate from the cupboard and smash in on the back porch concrete as hard as I could. Then I would get the broom and sweep up the mess. Hey - don't judge. It worked. Well, Peanut's mama is also the mama of a darling, but difficult little boy. So I shared my secret parenting tip with her. 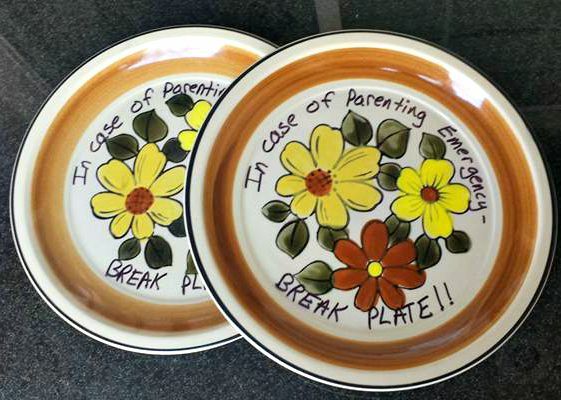 And just in case she wants to save her nice dishes - I'm sending her a couple of ugly, Goodwill plates. Just for emergencies. Thanks for stopping by. I'd love to hear your best parenting or coping tips in the comments. Did you know that when I moved to Las Vegas two years ago I made a fantastically serendipitous decision? Completely obliviously (is that a word?) I moved into the same neighborhood as Christa Watson, aka Christa Quilts. Really, I can walk to her house without even working up a sweat. Unless it's summer, when I can't lift my right arm without working up a sweat and I drive to the mailbox two houses down with my AC maxed out. But I digress. It wasn't too long before church, neighborhood, and guild functions brought us together and we've been BQFs ever since. (Best Quilting Friends) So when Christa invited me to be a stop on a blog hop to introduce her new book, Machine Quilting With Style, I just hollered out the back door "You betcha!!" Another fun factoid about me - I love pieced backings. Christa knows this, so she asked me to take Technicolor, the pieced backing of her Color Crystals quilt, and turn it into a quilt front. Christa's Technicolor is made up of randomly cut and pieced solid 2.5 inch strips with bold black borders and is quilted with some awesome intersecting radial quilting. For my version, I started with a half yard bundle of Gelato Ombre by Elite and played with the colors a bit more to see what kind of movement and light effects I could get. Following Christa's great directions, I cut 2.5 inch strips but instead of piecing them randomly into 60 inch strips I grouped similar colors, moving from one color into the next. 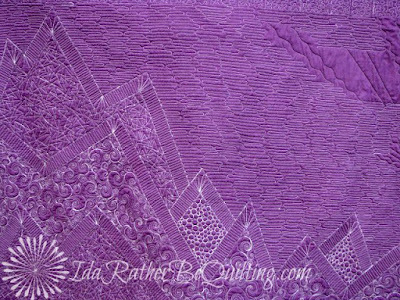 When I finished piecing the center I thought it looked like rays of sunlight coming up over mountains and buildings and breaking through pink and purple clouds. I named it "Urban Sunrise" and chose a concrete gray for the top and bottom borders. Christa has been a great help to me in my free motion quilting education. A lot of that help is contained in this book. 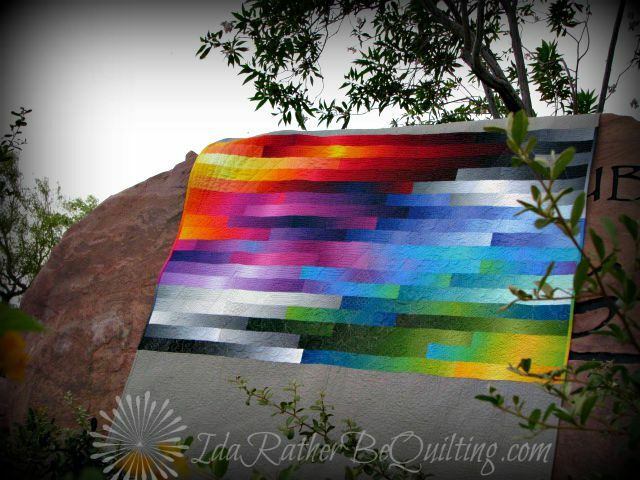 Once I was finished with the quilt top, I got a crazy idea and decided to use several of Christa's fmq motifs to quilt in the mountains, clouds, and sunrise that the colors evoked. 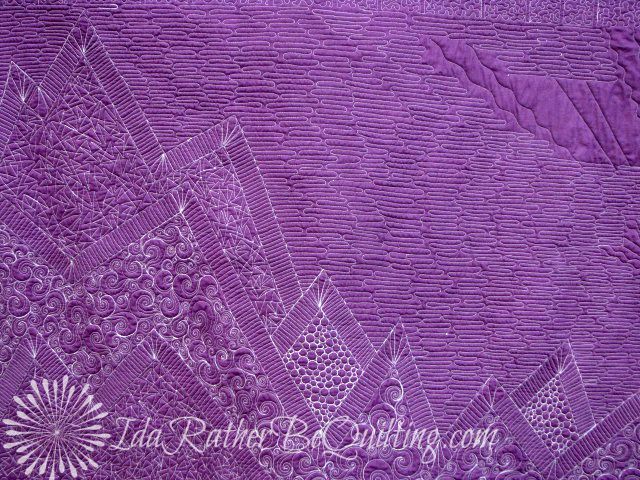 It's hard to see on the front but on the back you can see triangle texture, pebbles, and spirals on the mountains, with switchbacks defining their edges. All these designs are taught in Christa's book in a section called Free Motion Favorites. I also used a simple stipple inside irregular boxes on the gray borders to give an urban, architectural look. My spirals are different than Christa's spirals. 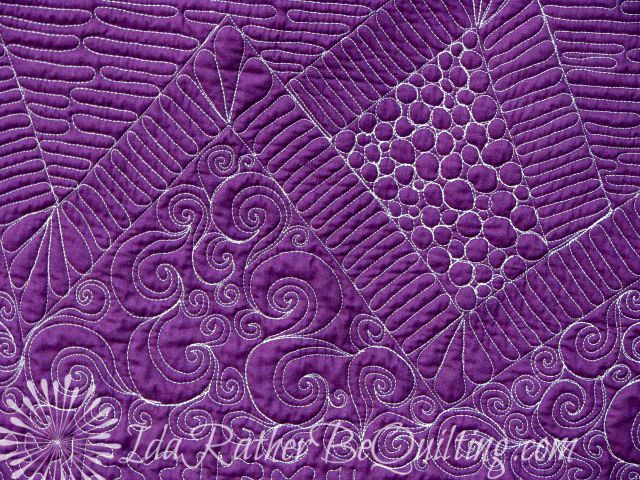 While trying to conquer the FMQ spiral, I was given some good advice by another BQF, Vicki Ruebel of Orchid Owl Quilts. She told me to find my own spiral. That eventually, as I practiced, something would start to feel natural. And that is what happened. I think that is great advice for all types of FMQ. If you practice, not only will the motion feel more intuitive and less awkward but you'll find your own pebble, your own spiral, your own stipple. 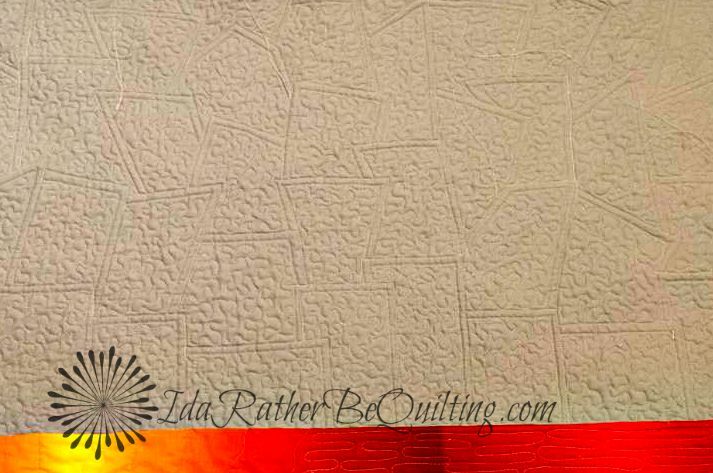 And then you will start to feel more confident in your quilting. 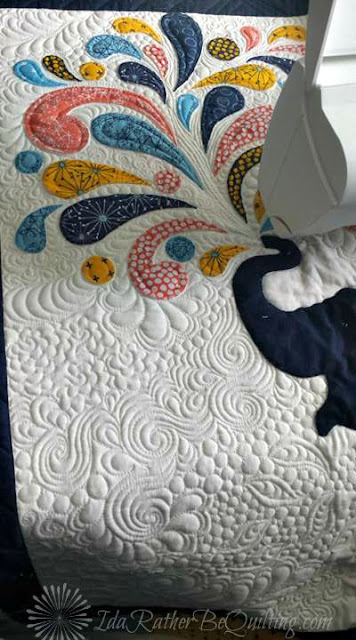 So much of Machine Quilting With Style is about developing confidence as a quilter. Christa is a great champion of being the maker of your quilts, from start to finish. 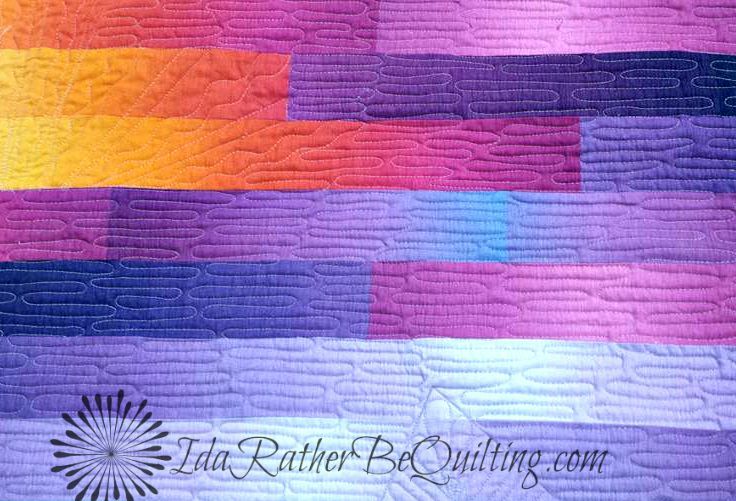 Her book has 12 great projects and tons of wonderful information about both walking foot quilting and free motion quilting. You can read my Amazon review of the book here. 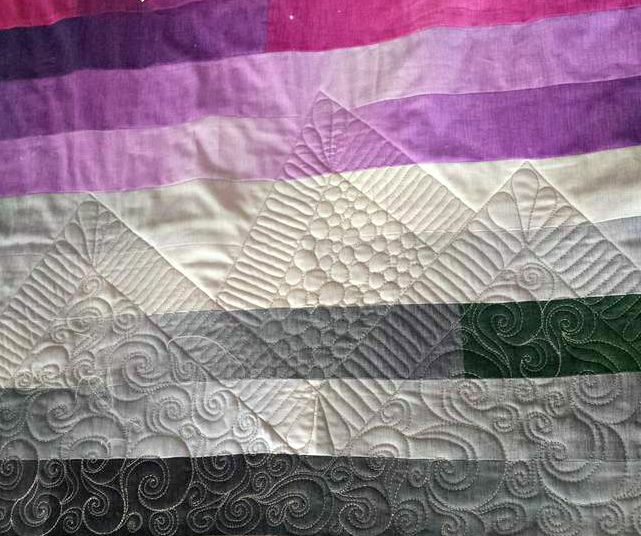 Something else I love to do, that makes a quilt mine - is to do a pieced binding. I did this on my Fall Out Quilt and my Set Sail Quilt. 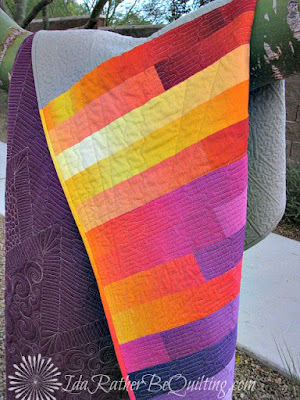 With Urban Sunrise I was able to use the ombre fabrics to echo the color progression in the quilt. That made me pretty happy. 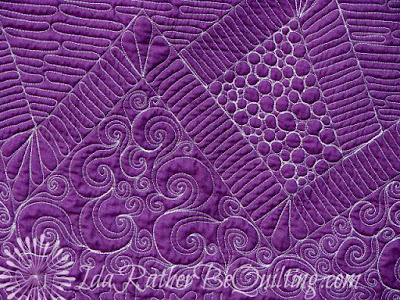 Be sure to visit Vicki at OrchidOwlQuilts.com today to see her version of the front of this quilt as it appears in Christa's book. And of course, Christa will have the original versions of both Color Crystals and Technicolor. You'll find the schedule for the rest of the blog hop on Christa's blog as well. And be doubly sure to order the book. 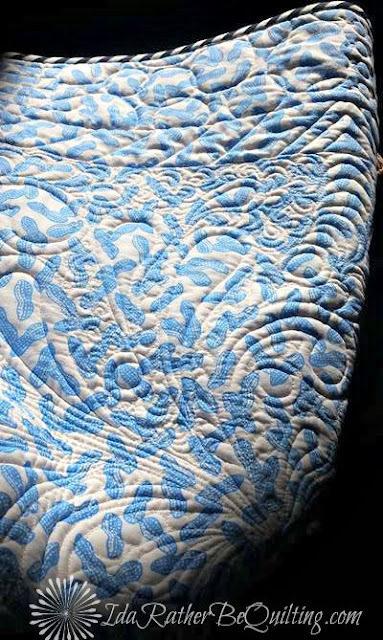 Machine Quilting with Style will help you with your FMQing whether you are a trepid beginner or a fine tuning expert. You can order the book from Amazon here or from Martingale Press here. Or if you want a signed copy, you can order one directly from Christa here. 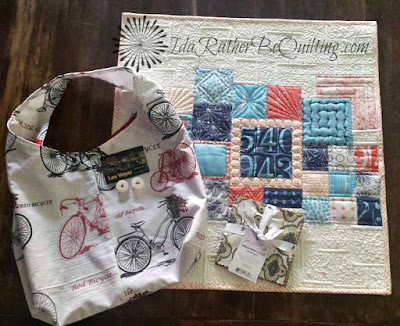 Thanks for stopping by-whether from ChristaQuilts or elsewhere, I'm happy to have you visit. 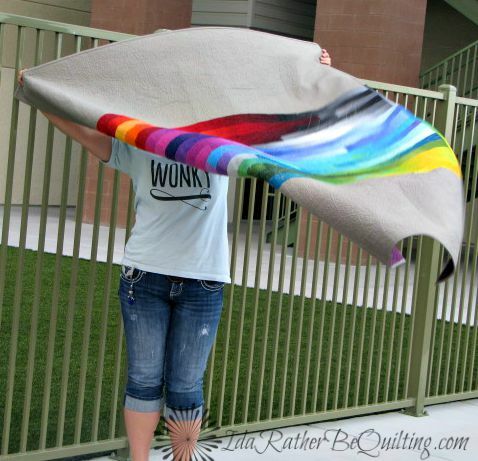 Stay Wonky my quilty friends! Linking with Can I Get a Whoop Whoop?, Finish It Up Friday, and Needle and Thread Thursday. So I'm SUPER excited!! 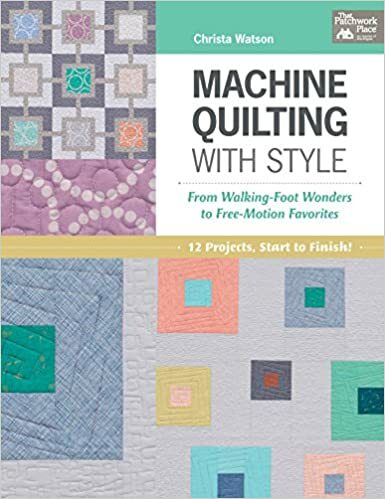 Christa Watson's book, Machine Quilting with Style, came out yesterday. 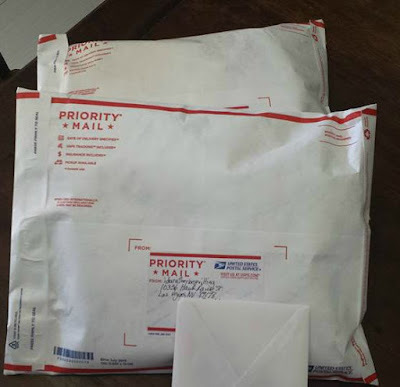 I'm lucky enough to be friends with Christa and she asked if I would be a part of a blog hop to celebrate her new book. So next week I will be showing you a quilt from Christa's book. I'm just about done with it and I thought it would be fun to do a Work In Progress post and give you a little teaser. 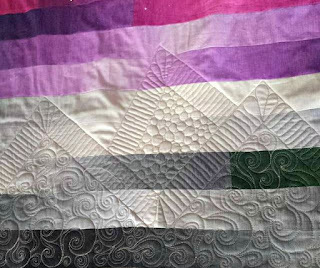 The quilt she invited me to make is actually presented as a pieced backing to another quilt in her book. But I could see it as a fabulous quilt in its own right. I hope I pulled it off. I've been trying to perfect my FMQ swirl. My uber-talented BQF Vicki of OrchidOwlQuilts.com gave me some advice - don't try to copy other people's swirls, find your own. Well, I think I may have just done that. I was looking at a piece of fabric and decided to try copying the swirls on it. What do you think? 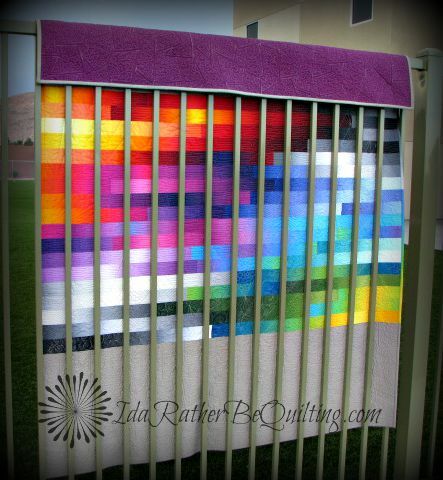 The body of the quilt is just 2.5 inch strips. 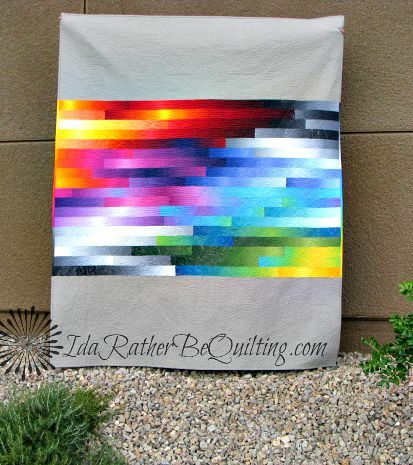 But I'm working with ombre fabrics which add some really wonderful movement in the color gradiation. The borders are a concrete gray and I went with a very angular quilting design trying for an urban feel. I'd better stop blogging on get back to work so I can bury all those threads you can see in these photos and get the quilt bound and labeled by Monday. I hope you come back to see the complete quilt then. In the meantime, pop over to Amazon or Christa's blog, Christaquilts.com, and get a copy of her book. I got an advance e-copy and it's fabulous. Here's a link to my Amazon review of her book. And here's the book. You can purchase it at this link or on her blog. See you Monday, September 14th! Howdy quilty peeps! I'm currently working on a large quilt and while it is going well (sneak peek to follow), I've decided that I really love minis. 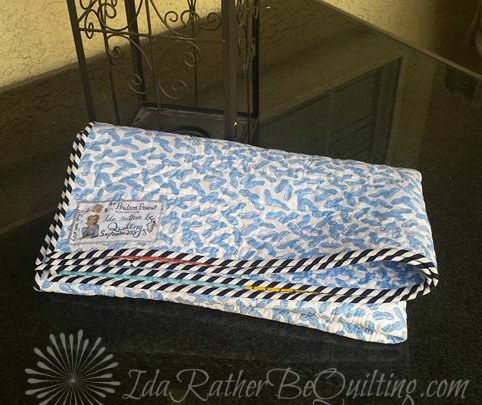 They are so easy to quilt because you aren't dealing with the dreaded drag of a large quilt's bulk. I have a long armer friend who has been whispering tempting phrases in my ear about the joys of long arm quilting. And while life circumstances dictate that purchasing a long arm is not a prudent choice for me right now, I have to say it does sound enticing. 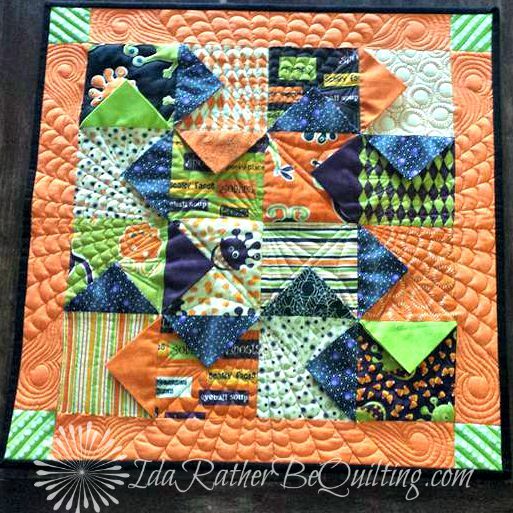 I have to admit, those quilted spider webs make me squeal! The tutorial for the 3D pinwheels can be found in the previous post. 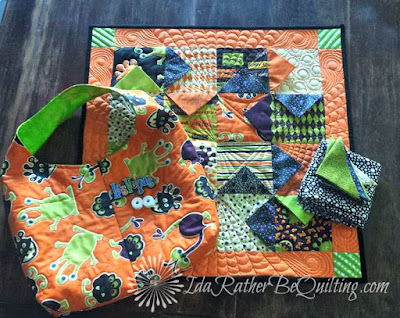 The fabric line is Monster Bash by Moda and the quilt finished at 21 inches square. I had a half yard of one of the prints in this line so I pulled out an old pattern and made this cute hobo sling bag. It's actually quilted but I just outlined each of the monsters in orange thread so it's fairly subtle but does give a nice weight to the bag. Perhaps it will make a good trick or treat bag for my partner's kiddos. I also included some scraps and a bit of yardage from the backing, along with a Las Vegas magnet and two bobbins of clear thread for her to try. I also made a non-quilted version of the hobo bag to include with my text me mini quilt swap along with two clear bobbins, a charm pack and a Vegas magnet. Pictures of the mini can be found in this post.